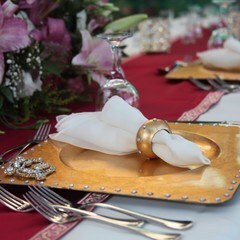 Gaby and Houssain beach wedding in Turkey organized by Wedding City Antalya International Wedding Planner. 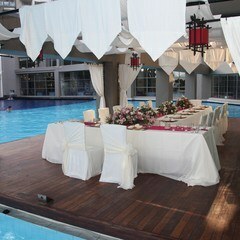 Dear Gaby reached us by e-mailing us for their beach wedding in Turkey Antalya. It was very cheerful to correspondence over e-mail and Skype. Gaby’s family was from South Africa and Gaby was Netherland citizen. Gaby was at peace with oneself, endearing, thinking positively bride. Houssain was Syrien citizen living in Mersin Turkey. He was the rough-looking, petulant but softhearted groom. Our friendship has started like we know each other for years when we met for legal document requirements for civil marriage in Turkey. Beach wedding in Turkey is always the first choice. 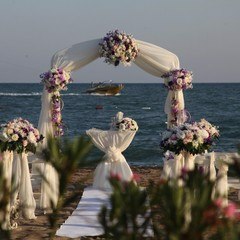 Gaby & Houssain also asked for Beach wedding for their wedding in Antalya Turkey. We have prepared a colorful, chirping decoration on the Beach. Everything was Perfect and in harmony.Gaby & Houssaing were dark-skinned and they both were stunning with a white dress. Houssain was very handsome with a white suit. Also, Gaby was stunning with a white bridal gown. Gaby’s aunt influenced me as well. Her grey evening gown consisting of a modern line, accessory on her head reflecting the culture of South America and perfect physique was very impressive. 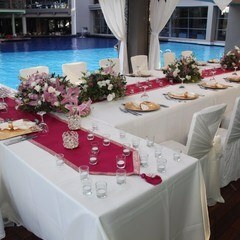 We have prepared a magnificent wedding dinner table at Limak Lara De Luxe Hotel’s poolside platform for Gaby & Houssain.Special prepared wedding decoration made them happy and touched them deeply. Their happiness made me and my team very happy as well. We forgot all of our fatigue. Dear Gaby & Houssain, we love you!! !